Monday is Bastille Day. While the Bastille is gone, Paris abounds with structures that were there before that infamous jail was ever built. Notre Dame may be the second most famous place in Paris after the Eiffel Tower. It sits on its little island, removed from much of the hustle and bustle of central Paris. My first impression was of it being much smaller than I'd expected, comfortingly human-scaled. I am always looking for an angle or view that can make the familiar seem new in some way. 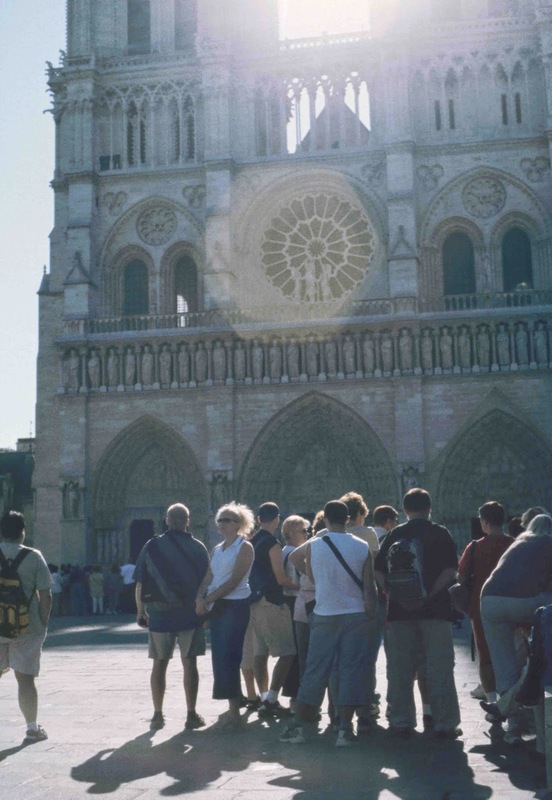 On this particular morning, backlit tourists and a sun flare positioned right over one of the rose windows helped me see with fresh eyes a sight that some think of only as a Paris cliche.